MEMPHIS, TN – Tupac Shakur (or 2Pac), a West Coast rapper and actor, was gunned down on Sept. 7, 1996, in a drive-by shooting at an intersection in Las Vegas, Nevada. His fans still mourn his death. The Notorious B.I.G. (or Biggie Smalls), an East Coast rapper, was killed in a drive-by shooting by an unknown assailant on March 9, 1997, in Los Angeles, Calif. His fans still mourn him too. 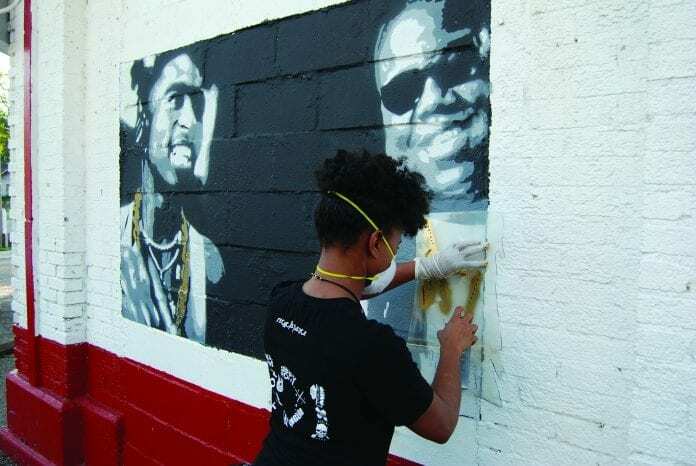 Aiesha Overton, a visual artist known as Naima Peace, was a little girl when both rappers died in the middle of an East Coast and West Coast feud that went awry and rocked the hip-hop world. She is one of their biggest fans. Peace’s love and admiration for both men are reflected in a small mural she’s stenciled on the East wall of the North Memphis Market at the corner of Vollintine and Avalon in the historic Vollintine-Evergreen neighborhood. The corner is a magnet for criminal activity and wanton violence. A man was recently killed and another one was wounded after a gunman opened fire and left behind a gruesome display of humanity. The corner is infamous for such dastardly acts of violence. Peace drew her inspiration from 2Pac and Biggie, which she juxtaposed against each other in monochromatic colors and separated only by the gulf that divides them. Violence, tension, struggle and peace are words the artist used to describe the rappers’ creative output of heartfelt music, which fueled their fans’ loyalty, respect, adulation and idolatry following their untimely deaths. Peace is an artist of impeccable talent, but it is her insight and search for peace in a violent world that motivates her and drives her into advocacy mode. In fact, “Naima means peace and feminine tranquility,” she said. While peace is the operative word, the artist heads an organization called “Recycle Peace,” a creative consortium of artists working hand-in-hand to offer their services – whatever genre of art, whatever medium. Before the artist made the decision to create art while advocating for peace, she studied civil engineering at the University of Memphis. “I’m two semesters shy of receiving my civil engineering degree,” she said. “I want to do bigger and better pieces that transcend my art. And I want to think outside the box,” said Peace, noting that everything she’s created then and now has to mean something. Peace graduated in 2008 from Germantown High School. A quiet spirit, she is adept at critical thinking, which she applies to the creative process. It is a luminous calm with spiritual overtones.